Potassium Silicate, sometimes called Water Glass. Used in Stiffening of the wood. Used on the inside of the instrument and claims have been made that it may enhance the tone of the instrument. We understand from our supplier that this product has a concentration of 30 % and for use on wood it must be thinned down to 5 % by adding distilled water. We have not tested this product, however customers have been asking for it. Comes in 4 oz bottle. Liquid Color Extract for Coloring Varnish, 1 oz will Color 15 oz of Oil or Spirit Varnish. You may add 5 to 7 % Extract in Colorless Varnish and 2% to Colored Varnish. You may blend your own Special Color. Colors: Yellow, Red-Brown, Amber, Golden Brown, Red, Brown, Blue, Green. Size 1 oz......Please Specify Color when ordering. Please note that this item can only be shipped by UPS Ground USA. Canada Post Expedited or UPS Ground to Canada. 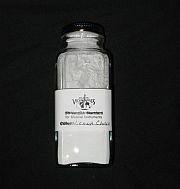 Vienna Chalk Powder 3 oz package. Use with polishing oil for high gloss bright polishing. Chemical name: Calcium-Magnesium-Carbonate.---Group: Limestone. Liquid Brush Cleaner--4 oz. Flammable product. 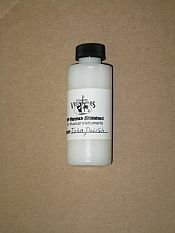 Liquid Drying Agent for Standard Oil Varnish--4 oz. You may add 2 % to 5 % for faster drying. Please note that all class 3 flammable products can only be shipped by UPS Ground to USA. Canada Post Expedited or UPS Ground to Canada. Camal Hair Touch-up Brush 1/16"--Wooden Handle--Overall length 6 3/4 inches. Round Glue Brush: 100 percent hog bristle with plain wood handle. 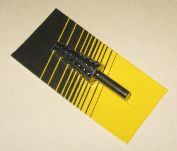 Short bristle provides stiff brushing action for application of resin or glues. Size: Diameter 1/4 inch, Length 8 inch-- Bristle length 5/8 inch. Joha High gloss cleaning & preserving polish--2-oz. Made in Germany. Put on and wipe dry--Leaves high gloss shine. Very Good Product . Micro-Fiber Polish Cloth. This Planet Waves cloth traps particles deep insite its fibers (2000 times finer than a human hair) and eliminates the need for harmful cleansers, last considerably longer than ordinary cloths and can be washed multiple times. Great for cleaning instrument after playing. Size: 12 X 12 inches. Italian Pumice Stone Powder--00 Fine--3 oz, For polishing out the final varnish coat to a satin finish, use with polishing oil. Rottenstone Powder-- Fine-- for buffing to a gloss shine, can be used after Pumice Powder---Size: 3 oz size. Gelatin Powder, used in sealing new wood before varnishing--to be mixed with hot water---Size 3oz. Instructions: Dissolve about 30 grams (1 ounce) in 1 liter of water, heat till solution is clear and thin. More than one coat maybe necessary, lightly sand with fine sand paper between coats. Make sure instrument is sealed completely before varnishing. Antique Stain # 421--Ready to use Oxidation Stain. 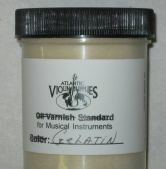 Violin with bare wood should be treated (sealed) first with Gelatin Powder mixed with warm water. This ready oxidation stain can then be applied after the instrument is sealed. After the application, the color changes under the effect of air and daylight from being colorless to a antique light middle brown. Once the color has be reached, gently sand with fine sandpaper and apply 1 coat of base (primer) varnish. Test stain and varnish is suggested to see what the results will be. This stain particularly draws out timber rings. Sold in 4 oz size. Used on the neck area of violins, this area is never varnished--Size 4 oz. 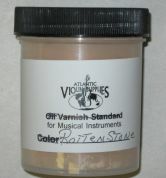 Dirt & Rosin dust can be removed from the instrument after playing using Joha Varnish Cleaner. 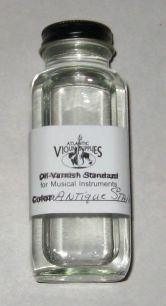 Drop some Varnish cleaner upon a soft cloth and wipe off the instrument. Polsih lightly after some time. If necessary this process has to be repeated. Especially sensitive varnishes must be proved compatibility before using this cleaner. 30 ml size. Made in Germany. Hidersol. For Cleaning and Reviving the varnish of string instruments. Made in England-Size 50cc. Made from high quality double napped cotten flannel. Picks up dust and dirt more efficiently than an ordinary polishing cloth. Liquid Water Stain: Used after Gelatin Powder (sealer) and before Varnish---Colors: Yellow, Red, Orange, Golden-Brown, and Brown. Size 4 oz. PLEASE SPECIFY COLOR WHEN ORDERING. Note: Colors in stock--Brown, Yellow, Red, Orange, Golden Brown. Oil Varnish Primer Use after gelatin and before Colored Varnish----Colorless. Size: 4 oz. Please note: All class 3 flammable products can only be shipped by UPS Ground to USA. Canada Post Expedited or UPS Ground to Canada. PLEASE SPECIFY COLOR WHEN ORDERING. Please note: that all class 3 flammable products can only be shipped by UPS Ground to USA. Canada Post Expedited or UPS Ground to Canada. Use with Pumice and Rottenstone Powder in polishing out the final finish after varnishing--Size 4 oz. Please note: All class 3 flammable products con only be shipped by UPS Ground to USA. Canada Post Expedited or UPS Ground to Canada. 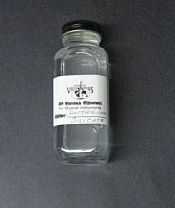 Oil Varnish Dilution---Size 4 oz. Please note: All class 3 flammable products can only be shipped by UPS Ground to USA. Canada Post Expedited or UPS Ground to Canada. Varnishing Brush, Ox hair. Size: 1/2 inch wide. Varnishing Brush Ox Hair, 3/4 inch wide. Varnishing Brush, Ox Hair 1 inch wide. Franklin Hide Glue for Musicical Instruments--4 oz...Liquid form, holds more than 3500 psi, setting time about one hour--depending on humidity. 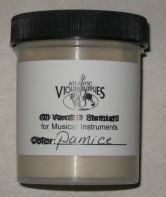 Used for non permanant glueing, allows wood parts to be disassembled--an excellent benefit in restoration or the repair of musical instruments. Granulated Hide Glue--444 Gram/20 Mesh-Strong hold good for all work----Non Toxic Mix with hot water. One Pound Package. Granulated Hide Glue 3 Once Package. Cello String Lifter, Holds strings in position-permitting removal of the bridge. Durable, height adjustable with protective foot pads. Hand Held Marking Caliper-with 9 inch throat for marking graduations of top and back of Violin & Cello. Precisely machined, black anodized aluminum. Thickness can be quickly and accurately set with convenient set screw. Comes complete with Lead Insert for marking. See Item # 745T for extra lead when needed, However one lead will do for a long time. Cello Sound Post Setter, S Style. S---Style Sound Post Setter for Bass. Bending Strap with Handles---Strap Size: 2" X 12" X 0.010" thickness, used with Bending Iron, for bending sides for Violin or Mandolin. Fits through F Hole for patching work without removing the top. Patch is lightly glued to clamp and then positioned through F hole for clamping in place. Available in Size Depth of 1 ", 2", 3", or 4". (Inch) Priced for set of 4. Pointed Divider 8 inch--Hardened and tempered Steel--Bow Spring. Stainless Steel Ruler--12 inch long and Graduated in Inches & mm. 1/8 inch think--last for years-a must to have for any work shop. Machinest Scribe--8 1/2 inches in length with one end straight and other end bent for picking. Steel with Treated Points. A must to have when working on Bow Frogs and other projects. For measuring the precise amount of hair needed for tying a given hank or use in re-hairing Bows. Marked graduation scale, suitable for all hank sizes--Violin, Viola, Cello, Bass. Dull finished stainless steel. Inside Caliper--8 inch. Hardened Steel-Tempered with Bow Spring tension. Great tool to have on any work bench. Stainless Steel Tweezers 7 inch with fine serrated points. Mini 6 Inch Hack Saw for fine work comes with blade. Blades for 6 inch Mini Hack Saw # 769T--Package of six blades. Fishtail Tapered Paring Chisel--the unique feature of these Chisels is the blade which tapers from the cutting edge to the shank thus allowing greater flexibility and control when working in tight areas. The handles are made from the best quality red oak--overall length 9 1/2 inches, blade length 2 1/2 inches...comes well sharpened--Working Blade Width 1 inch. On sale till end of stock. Eight Inch Cabinet Rasp--double sided --one side flat other side 1/2 round shape. Used for shaping wood. Length 8 inches--two sided--Flat one side other side 1/2 Round. Used for shaping wood. Rough and smooth on both sides. Four piece Dental Pick set, Stainless Steel, assorted tips. Dusting Brush--Natural Soft Hair, for fine dusting in small areas--great when sanding. Overall length 4 1/2 inches. Nut Spacing Template--used for spacing of string division. Measurements from 11mm to 40 mm, for Violin, Mandolin and Banjo. Lower Block Rib Clamp. Used for gluing ribs to the lower block without disassembling the instrument. Insert into the end pin hole and the steel pivot automatically flips into the cross position, turn over to remove. Wooden block clamp with cork pad. Violin and Viola. Cork-in Sheet form Size 12 inch X 12 inch X 2mm thick. Used for cousion on the bottom of Chinrest. You may cut the size needed for use. Rugged Blue Denim Workshop Apron, Two pockets--37 inches long. Punch Awl---Forged from the best quality tool steel. The tip is ground to a needle point and is suitable for scribing a line or heavy use as a punch awl. The handle is made from top quality Japanese white oak, attached to the blade with a socket and tang for a lifetime of use. Size: 4 inches in length. Wooden head with 6mm screw makes shaving of bushing stick easy. Drill a small hole in the end of the bushing stick--approx. 5.5mm-- and screw this tool into it, then you may use a peg shaver for tapering the bushing stick to the proper size to fit the peg hole. Maybe used for Violin, Viola, Cello. Lighted magnifying Visor Adjustable Head Ware. Comes with 3 plastic lenses and Removable LED Light. Back by popular demand by our customers. Jeweller's Hammer--Drop Forged--Polished Head--Hardwood Handle--2 oz. Great small hammer for lite work. Purfling Cutter for Violins. This is designed for Violin Purfling. As shown in the picture two Japanese Kogatana Blades makes the purfling slot. The blade is adjustable both height and distance of the purfling from the edge. Total length of tool 120mm, Brass with Wooden Handle. See item # 851TJ for extra blades when needed. This tool comes with blades and is ready to use. Made in Japan for Luthier work--5 piece Small Steel Scrapers. Designed when working on violin necks, scroll and also hard to reach places when sanding. Used for many different instruments. Five different shapes, a must to have when doing luthier work. Japanese Chisel--Blade width 3mm--Wooden Handle. Quality Made in Japan. Used for narrow places where needed. For use on wood--total length 223mm. Japanese Chisel--Blade 6 mm wide---Total length 223mm. Wooden handle--made in Japan. Nice tool-Japan Quality. For use on Wood. Japanese Chisel--Blade width 12mm--total length of tool 123mm. For use on Wood--Made in Japan. Japanese Chisel--Blade width 24mm--Tool length 223mm, For use on Wood-Made in Japan. Japanese Spoon Shape Gouge, Blade material is Shiagami white steel and HRC64. 180 mm total length. Blade Spoon Shape width 9 mm. Ideal for working in small areas. Superior quality--Made in Japan. Japanese Spoon shaped Gouge. Blade material is Shiragami white steel and HRC64. 180mm in length, Spoon Shaped Blade 15mm wide. Nice wooden handle--Made in Japan. I real must to have for instrument making. This product is a special item which mixed a Rasp with the Blade of a Saw. It has both rasps and blade's with good point that are fine cut and fine sharp. The blade has special shape that has less clogging. The material is high carbon steel, very durable with superior blades. This item is double sided-course one side and fine on the other. Suitable for any shaping from rough to fine wood work. Blade length 250 mm or approx. 10 inches. Superior Japan tool quality. Pointed Tip Knife--Double Sided--Right and Left Side of blade Beveled. Allows you to work in places where you are unable to with a regular knife. Pointed tapered blade grate for shaping instrument bridges and scroll work, Such as inside a circle or corner. The original wooden shaped handle gives nice grip feeling. Over all length approx. 200mm, Blade length 60mm and handle 140mm. Japan Quality--made in Japan. Made in Japan: Fine Cut Saw--Fine tooth blade with thickness of 0.3mm. Blade Length 160mm and nice Wooden Handle 110mm length-total length 270mm (10-1/2 inches) Teeth pitch 0.9mm. Saw working blade depth 30mm or 1 1/4 inch. Very Nice saw for your workshop. Carving Knife--Total length 220mm or Approx: 8 inches--Blade 60mm (2 3/8 inch) Handle 140mm (5 1/2 inch) Curved Blade and tapered on both sides with wooden handle. Quality made in Japan. Outside Spring Caliper 6 inch working throat, hardened tempered spring loaded steel. F-Hole Drill Set--The ideal tool for cutting perfectly cylindrical f-holes. Centering pin mounted on a beechwood handle. Comes with 10 interchangeable, double beveled drill bits. Violin/Viola--5.5, 6.0, 7.0, 7.5, 8, 8.5, 9, 9.5, 10mm.------ Quality Made in Germany. End Button Holder-The ideal tool for removing stubborn end buttons and for holding end buttons while shaping their shaft. Screw clamp with leather-lined end button holder. Brass body, fits all violin and viola end buttons which have a maxium neck diameter of 9.5mm. Finger Board Clamps-For an even distribution of clamping pressure when gluing fingerboards in place. Use one piece on top of fingerboard and one piece on bottom of neck. Two piece wooden set. These are made for using on a neck Violin 4/4 size and larger. If using on smaller neck length then they would have to be cut to fit accordingly. Pressure clamp shown in picture not included. French Scraper Blade, made of Spring Steel, excellent blade durability. Size: 150mm X 50mm X 0.40mm thickness. Used for smoothing surfaces and removing marks left behind by carving or routing or just leveling uneven varnish coats. Safety Scraper--Includes 5 Blades and Accepts Standard Single Edged Blades. Metal Construction. Fits through F-hole to measure correct length of sound post. Made of metal. Fits violin and viola. Same as No.706T above except designed for cello. This device enables anyone to fit the feet of a bridge quickly and perfectly. Fits violin and viola. (Bridge not included). Marks precise string division on bridge from 1/8 violin to 4/4 cello. Ibex Purfling Groove Cutter---Brass with hardwood handle. Adjusts from 1/16" to 1/4". Use single blade for edge purfling and both blades will give you a 0.85" channel. (if needed) Ajustable with Allen Tool included----Horisontally or Vertically. Manufacture recommends using only one blade for Violin Purfling. For purfling groove cutter No. 709T above. Draws together and aligns crack for gluing. For violin & viola, s-type. Scissor style. Fits violin, viola and cello. High strength plastic, for gluing finger boards. Works like a pencil sharpener, fully adjustable for peg size 1/4 to viola. Machined Aluminum--adjustable to any taper. Same as No. 716T above except for cello. Cutting Blade For No. 716T above. Used in conjunction with peg shaver, fast and precise fitting of pegs. For Violin Full Size & Viola. Note: Standard 1:30 Taper--3 straight flutes. NOTE: See item # 717TSV for smaller size Violins. Same as No. 717T above except for cello. Standard 1:25 taper--3 flutes. Used to join cracks on top or back. Set of 4. Fits violin and viola. Factory set with indicator rod, gives correct angle of neck with fingerboard on or off instrument. For violin only. The finest violin maker's plane available, cast in silicone bronze with chrome vandium blades, holds a fine cutting edge. The sole is slightly rounded with matching standard blade. Toothed blades are available. 25mm plane with 8mm blade. IBEX 30mm plane with 10mm blade. IBEX 36mm plane with 12mm blade. IBEX 47mm plane with 18mm blade. For No.720T above. Size 8, 10, 12, or 18mm. Extremely rigid die-cast aluminum frame, unique top lifting lever allows unrestricted measuring. Comes with measuring dial. 32cm throat and measures to 30mm. May be used for other instruments making such as: guitars and mandolins. Ibex Bending Iron--Rheostat control, lifetime heating element. Cast aluminum, oval shape, mounts horizontal or vertical. For bending violin, viola, cello, Mandolin and Guitar sides. Designed by Irving Sloane. Available in 120 V or 220V---please specify when ordering. Holds the strings in position permitting removal of the bridge, durable black plastic with protective foot pads. Aluminum, padded tightening screws on top and bottom. Side screw used to properly position side of instrument. Used when gluing top underneath the fingerboard, aluminum, protective lining. Leather pads, plated rod, for viola and violin, for gluing top and back on body. Sold individually. Same as # 728T but used for Stand Up Bass, used for glueing back or top to sides. Same as No. 728T above except for Cello or Guitar. Fully adjustable to hold any size (except largest violas). For repairs, fingerboard sanding, bridge fitting, top crack repair, etc. Aluminum with padded screws to hold instrument securely. Violin NOT included. To hold the end of the button while turning down the shaft. Used to pull the sound post out of the instrument--Violin. Holds bow securely while re-hairing all size bows. Made from tough clear plastic material, choose from full scale Strad or Guarnerius models. Made from tough clear plastic material, standard model. Scraper Set 0f 4--Used for many applications--great for violin making---Thickness 0.60mm, Rectangular 159 x 50mm, Convex/Concave 140 X 50 mm, Rounded 140 x 70 mm, Gooseneck 130 x 70 mm. Made in France. Pre-Carved Violin Top Size 4/4. European Spruce-Good Quality. Not Graduated. Pre-Carved Violin Back with Sides, Size 4/4. European Maple Slightly Flamed. Not Graduated. European Spruce in Block Form---Fine Grain. Violin Full Size 4/4. Pre-Carved European Maple Violin Back with Sides--Better Flamed than 481CB. Not Graduated---Violin Full Size 4/4. European Flame Maple One Piece Back in wedge block form with matching sides-Violin 4/4. Used for making a one piece back violin. Back with Sides---One Pice Block, Flamed. Used for making a one Piece Violin Back. Pre-Carved Violin Top Size 4/4. European Spruce Better Quality. Not Graduated. European Spruce--Pre-Carved-Not Calibrated---Very Fine Quality--Choice Resonant Wood--Violin Full Size 4/4. European Spruce End block---Note: One block will do one Violin. Tapered---Boxwood--Cello Bushing Stick...used for busing worn peg holes in cello peg box. Corner block--Note One block will do one Violin. European spruce. 38cm long. Approx--6-- Violin 4/4 Post in one stick. Finest quality--For Violin 4/4--Cut to fit--or cut down for smaller Violins. Tapered boxwood--Violin--for bushing the peg holes in worn peg box of violins. Set of 3. For one violin.---Note: one set of three pieces will do one violin.........you are getting one set when ordering......Enough to do one full size Violin. These are Fiber wood purfling with black outer edges and white in the middle--Width 1.2 mm....Quality made In Germany--Very flexible to use. Good quality--Block Form. European Spruce. Violin full size 4/4. Very fine quality, choice resonant wood--Block Form. European Spruce. Choice resonant wood, best quality. Block Form, European Spruce. Slightly flamed--Block Form, European Maple. Well flamed, medium quality. Block Form, European Maple. Better Flamed-European Maple--Violin Full Size 4/4. Neck Block, Deeply Flamed. Block Form, European Maple. Violin Full Size 4/4. Pre-Carved Violin Neck Full Size 4/4---Beautifully flamed. European Maple. Best quality, very beautiful flaming--Block Form, European Maple. Flamed--Block Form--European Maple--Violin Full Size 4/4. Beautiful and deeply flamed--Block Form--European Maple--Full Size Violin 4/4. Very beautiful flaming and good tone wood. Block Form, European Maple--Full Size Violin 4/4. Choice tone wood, best flamed. Block Form, European Maple Full Size Violin 4/4.